Absa once again hosted their popular #ConquerAsOne campaign in the lead up and during the 2018 Absa Cape Epic. The three-phase competition is now in its final stage of voting. Cecil Bosman and Francois Bosman won the reader competition, and Dawie Theron and Nelis Coetzee of Team 2Big were crowned the winning team in the rider competition. These two teams now go up against each other in a final round of voting, to win the ultimate prize: a coveted Absa Pride entry for the 2019 event. Cecil and his riding partners cycled from Marrakech, Morocco to Knysna, South Africa – covering 18,500km without any support. They used the trip as a platform to raise funds for Aids orphans. Overcoming many obstacles along the way, they supported each other to stay motivated and true to their cause. This led to an inseparable bond between these riding mates. Cecil hopes to take to Absa Cape Epic soil in 2019 with Francois. The Bosman brothers hail from Knysna, where they took to outdoor adventure at a very early age. Cycling has always been one of their hobbies, and together they have overcome many obstacles on the bike. Read Cecil Bosman’s full story. Known as Team 2Big, Dawie Theron and Nelis Coetzee are arguably the heaviest team to have ever competed in the Absa Cape Epic race, weighing in at an imposing 260kg. Despite their size they decided to take on the 2018 Absa Cape Epic since Dawie was determined to do the event before he turned 50. As the biggest riders in the field, in true #ConquerAsOne spirit, the two inspired others to believe in their ability as they fought to achieve their goal. Read: Dawie Theron and Nelis Coetzee’s full story. These teams have equally inspiring stories, but only one of them can walk away with the 2019 Absa Pride Entry to the Absa Cape Epic. Their inspiring stories of overcoming hardship on the bike got them this far, but now your votes will decide their fate. During each stage of the 2018 Absa Cape Epic, a #ConquerAsOne moment was identified and rewarded where teams showed strength of the human spirit. A panel of judges selected one #ConquerAsOne moment each day. These winners received a unique #ConquerAsOne jersey to wear during the following day’s stage. Stage 1: Andisiwe Skeyi and Malusi Buthelezi personified what teamwork is about as they survived the tough 110km route on Stage 1 of the 2018 ABSA Cape Epic. It was only Andisiwe’s second stage race, , having completed her first event just three weeks earlier. From early on, the two Exarro riders battled at the back of the field, Andisiwe struggling up the climbs, and by 35km the two were last in the field. As they survived the climbs and headed into the second half of the stage it was clear that Andisiwe was taking strain, but Malusi, a veteran of four Absa Cape Epics, proved to be the ultimate Epic #ConquerAsOne partner. On the climbs he pushed Andisiwe and encouraged her every pedal stroke, shouting ‘Power, Power!’. Together they pushed to the finish, Andisiwe managing to find a second wind, overtaking the second last pair in the final kilometre. Stage 2: When the tyre sidewall on Henry Angrove’s bike collapsed with 12km to go on the 106km second stage of the 2018 Absa Cape Epic, he accepted it would be a long walk to the finish line. As the two (add in his partener’s name) struggled along the dusty jeep tracks Robert Izzett and Pierre Griffioen, of Team MegaPointe, decided to help the pair in a most unusual way: First, Robert loaded Henry up behind him on his saddle and the two rode two-up down the road with Henry’s legs dangling out the side. And then, in a classic #ConquerAsOne moment, to ensure that Henry’s bike also got to the finish, Lyle skilfully pushed Henry’s bike while riding his own. Stage 3: During stage 3, Martin Epstein and Craig Gerber, who are competitive at the sharp end of the field, came to the rescue of an Exxaro team in trouble. One of the Exxaro riders had fallen and hit his head badly and Martin and Craig stopped to assist. They cleaned the wound with their last bit of water and called the medical staff, waiting with the two Exxaro riders until medical help arrived, and were then forced to ride without water to the next water point on a sweltering day. Martin and Craig’s gesture proved that camaraderie exists way beyond just the partnership of two riders at the ABSA Cape Epic. Stage 4: Few pairings are more inspirational than Fred van Zyl and Eric Knoetze at the 2018 Absa Cape Epic. Their combined ages total 128, with Fredaiming to make historyas the oldest finisher. Fred, a former farmer and pastor from the Northern Cape who is now retired in Mossel Bay, is 71 years of age and is already the oldest person in the race. Stage 5: No two riders enjoy the challenge of the Absa Cape Epic more than the Ezi-Come Ezi-Gro team of Robbie Rorich and Anthony Baird. The two last rode the Absa Cape Epic together in 2015, the year Robbie did his first event. At 19, Rorich –a top class trail runner, mechanical engineering student and artist– was one of the youngest riders to ever complete an Absa Cape Epic. Robbie rode again in 2016 and 2017 and was eager to maintain his streak. In the months leading up to the race he scoured the social networks but only managed to get an entry 10 days before the start. He knew of only one person who was likely to take up the challenge that close to the start – his Dusi canoe rat friend Anthony who, in typical #ConquerAsOne style, agreed to ride. Stage 6: When you think of your typical Absa Cape Epic riders you don’t think of Dawie Theron and Nelis Coetzee of the 2Big team. Between them they weigh an imposing 260kg and are arguably the heaviest team to have ever competed in the event. Since Dawie was determined to do the event before he turned 50, the two decided to take on the challenge despite their size. As the biggest riders in the field, the two hope that they will inspire others to believe in their ability to finish events like the Absa Cape Epic. MAY 29, 2017 – A R40-MILLION CONVENIENCE centre and service station development launched in Mthatha last week [SUBS: Thursday 25 May 2017] represents a vote of confidence in the provincial economy and improved services and facilities on the busy route connecting the Eastern Cape to KwaZulu-Natal, Lesotho and inland. Fort Gale Junction was officially opened on Wednesday night (SUBS: Weds 24 May 2017) by the Executive Mayor of King Sabata Dalindyebo Local Municipality, Councillor Dumani Zozo. During his address, Cllr Zozo commended local developers Ndamara Investments for their contribution to the economic growth of the area. He urged the audience to consider and support other investment opportunities in the region such as the proposed development of a new town in the Coffee Bay area. The complex combines a new shopping centre with a revamp of the long-standing Fort Gale Motors Caltex service station, and is a key part of a business strategy to invest in “bringing world-class services and facilities to traditionally under-invested or forgotten areas” of the province, says Caltex Eastern Cape Marketer (CECM) chief executive Clive Berlyn. The new development is a combined effort of a group of committed Eastern Cape investors – CECM, Prince Mzwandile Maraqana of Ndamara Investments, and the Novate Group – who together invested R40-million in upgrading Fort Gale Motors into a state-of-the-art fuel service station and developing the new Fort Gale Junction shopping centre. Ndamara Investments has been the landlord of Fort Gale Motors since its establishment in 1989, and Prince Mzwandile said he was “proud of the latest evolution of the site into a retail hub that brings services and convenience to local residents as well as creating jobs and economic opportunities”. Berlyn and his business partner, the late Richard Ndungane, had a long track record in business in Mthatha when they founded CECM in 2003 to acquire the master franchise for the Caltex brand in the Eastern Cape. CECM would continue to invest in the province, said Berlyn. CECM is a 100% Eastern Cape owned, and majority black-owned, company, that has invested over R400-million in the past decade in acquiring and upgrading the more than 100 service stations now in its network across the province. Berlyn said CECM had made at least half its investments in acquiring and upgrading service stations in the neglected eastern part of the province. “These have proven to be sound investment decisions, not just a feel-good exercise,” Berlyn said. The upgrade of the service station has created 18 new jobs, while Fort Gale Junction is expected to create more than 250 new jobs once the centre is fully tenanted, said Jo Berlyn of the Novate Group, which operates Fort Gale Motors. The partners are optimistic that the upgrade of the service station and the additional shopping and facilities will position the site as a flagship in CECM’s network of more than 100 sites across the Eastern Cape, restoring Fort Gale Motors to its former glory when it traded the largest volumes of fuel in the Caltex countrywide network in the early 1990s. Fort Gale Junction is expected to attract a mix of local businesses and national brands as tenants, with a KFC outlet already operating; while Fort Gale Motors has been transformed with the latest fuel technology and revamped layout to ensure easy access and efficient service. A one-stop hub for local residents and travelers, the revamped Fort Gale Motors now hosts a FreshStop convenience store which not only “boasts the best fresh fruit and veg in town” but also include a Grill to Go, Hooked on Fish and Hot Dog Bar. “In addition, we will also be adding a Seattle Coffee bar to the mix within the next few weeks” said Jo Berlyn of service station operator Novate Group. In his address at the Grand Opening, FreshStop Director, Joe Boyle said: “FreshStop at Caltex Fort Gale Junction is the 254th store in the national franchise network, the 29th store to open in the CECM area and the 2nd in Mthatha. FreshStop is proud to continue its relationship with Clive and his team, Sean and Joe of Novate, Ash and Wela from Chevron, and now, Goodmore and Nelly from Fort Gale Junction. 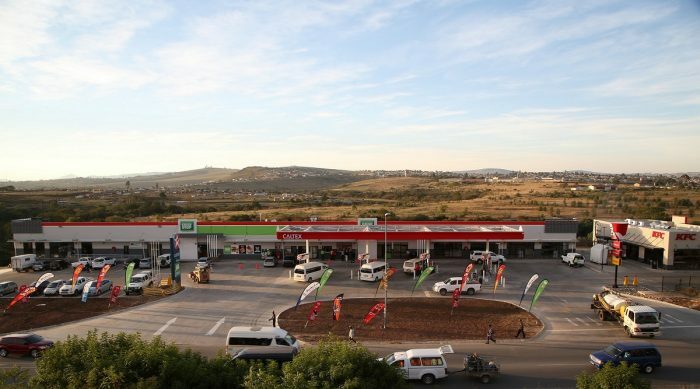 Fort Gale Motors is the second Caltex service station that the Novate Group has upgraded in Mthatha, after the re-launch of Northcrest service station in August 2016. Fort Gale Motors was part of the beginning of the CECM success story: it was owned by Clive Berlyn, now chief executive of CECM, when the company was formed in 2003 and acquired 34 service stations in the eastern part of the Eastern Cape as the first Branded Marketer territory in South Africa awarded by Caltex parent company Chevron. The company has since expanded into the west of the province and invested over 400-million in acquiring and upgrading the more than 100 service stations now in its network. CECM is the largest of 11 independent Caltex Branded Marketers in South Africa both by number of outlets and volumes of fuel traded, and the largest in Chevron’s Africa, Middle East and Pakistan region. Next: New restaurant trend “Fast Fine” is changing the way we dine – but what is it?